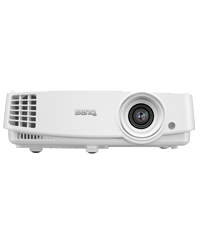 All our projectors are available for dry hire with collection from our Norwich City centre location on a day-by-day basis with considerable discount after the initial day. 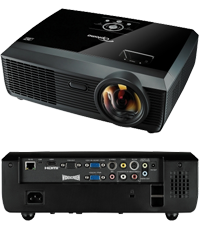 Projectors can also be hired as part of a delivered / installed hire providing they are hired with other equipment such as active speakers etc. If you need powered speakers to go with a projector we recommend the Alto ‘Troupers’ which can be found HERE. 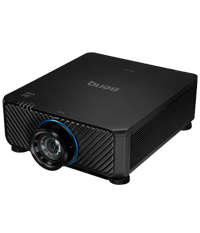 We are pleased to welcome BenQ to our hire fleet in the form of MH530 DLP 1080p Projector, super bright, sharp and colourful ideal for a wide range of modern applications. lThe BenQ LU9715 BlueCore Laser Projector is the brightest choice for large venue applications. BenQ LU9715 delivers 8000 ANSI-lumen brightness and 100,000:1 contrast ratio for superior viewing experiences even under bright ambient lighting. The BlueCore laser engine provides significantly improved colour performance through a dual colour wheel system, support for 360° and portrait installation, and 24/7 operation for expanded application opportunities.  Dry Hire Cost: £POA – Please call for information or to arrange a demo. The Optoma EX610ST short throw projector has a great range of input connections including 2 x VGA and HDMI. 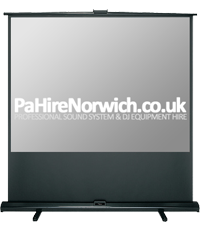 You can hire a projector on its own, or with a screen for either daily or weekly hire. 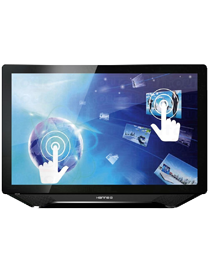 You can connect either a laptop, DVD player, standard computer or any device that outputs video to HDMI. The viewsonic PJD 6352 long throw projector has been newly added for 2015 and is equipped with 2x HDMI ports, ViewSonic’s SuperColour technology and wireless capabilities. This projector is perfect for high quality streaming and videos and with 3500 lumens it can be used in rooms with high ambient light. 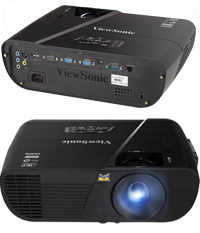 The ViewSonic Pro10100 projector is a hi-resolution, super high brightness projector perfect for producing an extremely large sharp image ideal for large screen applications including outdoor cinema. 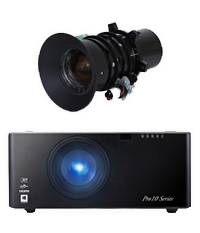 This features interchangeable lenses for greater flexibility and powered lens shift adjustment to allow this projector to be used in a wide selection of applications. This wireless presenter is the perfect addition to your presentation, it includes a clear red laser which can be used on most backgrounds up to a range of 15 meters. 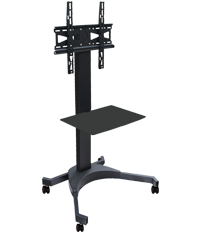 This screen is great for show stands as extremely stable, its also compact and comes with a carry case. Although this screen is massive it neatly packs away into a small box with wheels. Its great for public meetings, shows, cinema events our treating your staff to the football on the big screen. Combined with our 6000 ANSI ViewSonic projector this setup is great for corporate, public and special events that need a large viewing area for 100+ people. This screen will be fully installed and dismantled by our staff and is not available for dry hire. This TV stand is perfect for 32″-35″ TV screens and comes pre assembled. Please note a large vehicle will be needed to transport this item and delivery is available at an additional cost. This TV stand is perfect for 42″-70″ TV screens and comes pre assembled. Please note a large vehicle will be needed to transport this item and delivery is available at an additional cost. This Full HD LED free standing monitor gives amazing visual clarity and can be used for events, conferences and more. The Philips 55? 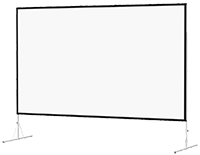 ultra HD screen is perfect for promo events, private film viewings, corporate events and more. 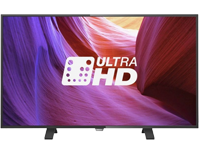 With its 4K resolution it is 4x the resolution of standard HD TVs and has multiple inputs including HDMI and USB.